Earnouts: What Are They, and How Are They Structured? An earnout is a contractual arrangement between a buyer and seller in which a portion or all of the purchase price is paid out contingent upon the target firm achieving predefined financial and/or operating milestones post transaction-close. Earnout structures involve seven key elements: (1) the total/headline purchase price, (2) the % of total purchase price paid up front, (3) the contingent payment, (4) the earnout period, (5) the performance metrics, targets, and thresholds, (6) the measurement and payment methodology, and (7) the target/threshold and contingent payment formula. Earnouts are best used to break purchase-price negotiation deadlocks during M&A transactions. These deadlocks occur most often when the buyer and seller’s perceptions of value depart the zone of possible agreement. They are also used as effective alignment and incentive tools that keep surviving management teams and shareholders driving toward the same objective. Earnouts are also most effective when a given seller is demanding an ambitious purchase price and the buyer would like to allocate more of the performance risk implied by that purchase price to said seller. The process of buying and selling firms is, by nature, complex and lengthy. Whether the reason be as part of a growth-through-acquisition strategy or a founder seeking to raise capital via a part-divestiture, M&A can be distilled into two components: valuation and risk allocation. In my many years as an M&A practitioner and expert, I have witnessed many an occasion where strategically accretive transactions to both parties fail to be consummated for differences in ascribed valuation or for an inability of the buyer to mitigate risk. In other instances, clever structuring has bridged differences between two divergent parties to great result, such as in Extreme Network’s acquisition of Broadcom’s Data Center Business, which leveraged various forms of deferred and contingent payments. As abstract concepts, both valuation and risk are rooted in the future free cash flows of the target enterprise. Specifically, valuation, often represented as the enterprise value, is the present value of a company’s future cash flows discounted to present day at its weighted average cost of capital. The implied risk is embedded within the relative uncertainty of these future cash flows. Unfortunately but oftentimes, exogenous factors in a dynamic marketplace increase the relative uncertainty around future cash flows so as to push both buyer and seller views on valuation outside the zones of agreement. When this occurs, contingent forms of payment, which include earnouts, escrows, holdbacks, and clawbacks, often represent the only available tools to break the negotiations deadlock. This article explores the structuring and use of earnouts, specifically, as one such tool for bridging valuation deadlocks in M&A deal-making. As part of this process, I will seek to arm both buyers and sellers with (1) an understanding of the benefits and risks to earnouts; (2) insight into when earnouts are best used and are most effective; (3) an analytical framework for understanding earnouts’ constituent/structural elements; and (4) empirical evidence that earnout structures do also serve as effective downside/risk mitigation tools. Our first question must be, what is an earnout? An earnout is a contractual arrangement between a buyer and seller in which a portion or all of the purchase price is paid out contingent upon the target firm achieving predefined financial and/or operating milestones post transaction-close. Earnouts confer a range of benefits to those who utilize them. Force difficult conversations between the selling or surviving management team and the buyer around how the asset will be operated post-acquisition. Let the target asset prove its worth. Afford the opportunity for an ambitious sale price, should said seller be willing to earn it—a purchase price that would ordinarily be unattainable at the then current discounted cash flow valuation assessed by the buyer. As with most structured finance solutions, there also exist some clear disadvantages to earnouts. The greatest of these is the potential for litigation in the period between transaction-close and the earnout’s expiration. Although in theory, earnouts align the interests of both buyer and seller to post-acquisition financial and operating success, there are several areas where interests, plans, and preferences still diverge. The most common of these is how the target firm will be run en route to achieving the mutually agreed-upon targets. This challenge is most common where the acquired firm becomes part of a larger business and strategy and is thus expected to operate differently from how it did as a standalone entity. Though the scope of this article doesn’t extend as far as exploring litigation issues, contractual provisions should be put in place that protect buyers against potential litigation from sellers. These contractual provisions typically fall into two categories. The first is to negate any and all implied obligation on the part of the buyer to achieve the earnout such that unsatisfied sellers cannot invoke covenants of good faith and fair dealing that claim the buyer operated the target firm in a manner that frustrated the company’s achievement. And the second provision should stipulate that the buyer has absolute discretion over the operation of the target firm post-acquisition. Beyond these, other variables do exist that also push up or down ascribed value during M&A negotiations. One such example is sentimental attachment by sellers that drive up price, which most often occurs when founders choose to sell their companies (i.e., their “life’s work” or “baby”). Buyers also have their set of emotional drivers. One such common example is buyers who undervalue a target as a fear induced knee-jerk reaction to a past experience gone bad. Firm A (buyer) has conducted an internal strategic review and concluded that it suffers an important product gap. Its competitive landscape has evolved such that its customers now prefer one-stop-shop solutions that include Product X, which it does not currently produce. Given that speed to market is critical in Firm A’s arena and it has great knowledge of its competitive landscape, it opts to acquire a startup, Firm B, which specializes in Product X. NDAs and financial and operating data begin to be exchanged in a data room. Firm A puts forward an offer of $4 million and Firm B counters with an ask of $16 million, pursuant to which both firms meet and negotiate face to face. Firm A explains that Firm B has only one year (2017) of financial history and that, though profitable, they are yet to prove that they can capture market share from other competitors. Conversely, Firm B explains that Product X is powered by patented, proprietary technology (lower cost) and is sufficiently differentiated from other products in the market to not only capture share but create new demand. Firm B’s view is that this will drive revenue growth at rates well in excess of industry averages. After days of negotiations, both firms find themselves in a purchase price deadlock depart without an agreement. Figure 3, above, illustrates/reflects the buyer’s model and assumptions—the x-axis shows Firms B’s EBITDA 3-year CAGR and the y-axis shows the implied enterprise values. 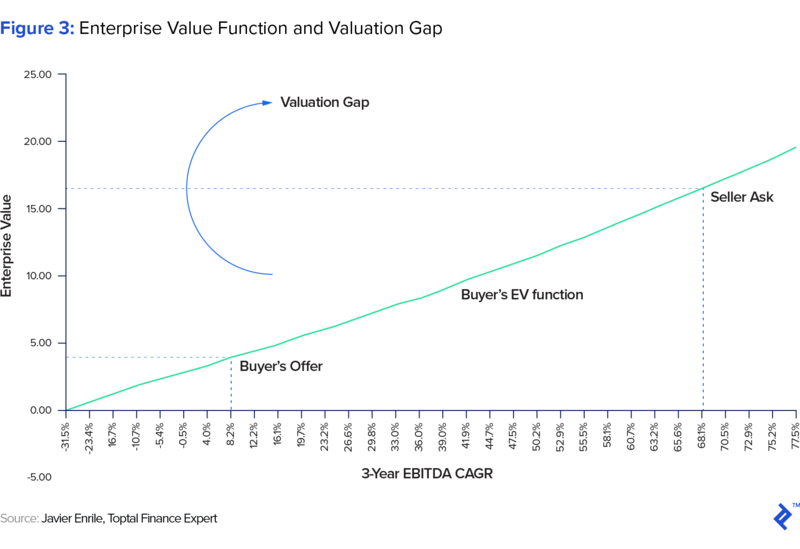 The buyer’s EV function reflects the range of implied EV possibilities for Firm B as a function of the discount rate, revenue growth, and cost basis assumptions it assumed during its analysis. Given that Firm A understands the strategic value to acquiring the capability to manufacture Product X as soon as possible, it opts to design an earnout structure that bridge the valuation gap, driven by its future cash flow concerns and thus breaking the negotiation deadlock. The following section looks at each of the key elements to consider when structuring an effective earnout, of which there are seven: (1) total/headline purchase price, (2) up-front payment, (3) contingent payment, (4) earnout period, (5) performance metrics, (6) measurement and payment methodology, and (7) target/threshold and contingent payment formula. These elements are best explained and understood sequentially, with each element building on the next. Total purchase price (or headline purchase price): The first step is to determine what the total amount is that will be received by the seller. If the buyer knows the seller’s ask and wants to maintain a strong negotiating position, then most often the buyer sets the total purchase price equal to the seller’s ask. This signals to the seller that the buyer is willing to bridge the entire valuation gap and affords the seller the opportunity to earn the purchase price asked. However, at other times, the buyer may not be willing to bridge the entire valuation gap and will instead set the total purchase price at 70% to 80% of the seller’s ask. Our simulated case-study assumes a total purchase price of $16 million, given the strategic value of the target and how competitive the acquisition landscape might become if others get wind of the transaction. Up-front payment: The second step is to determine what portion of the total purchase price will be paid at the transaction closing. 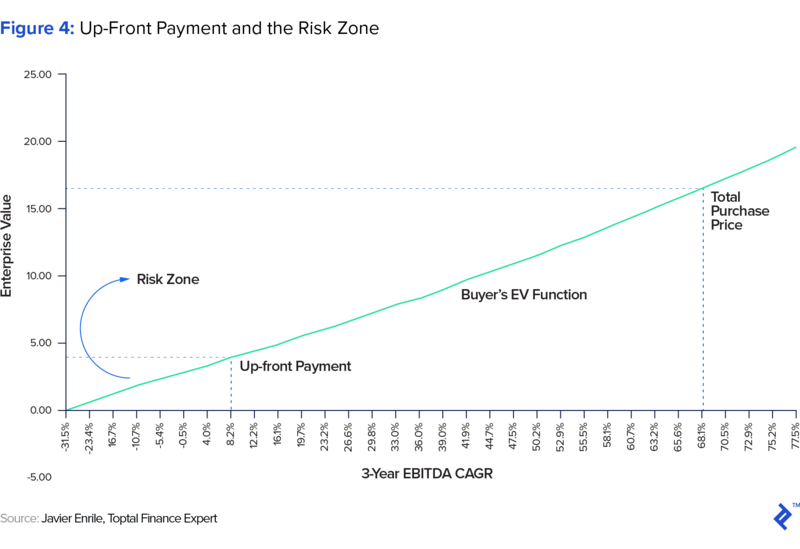 From a buyer’s perspective, the maximum amount of the up-front payment should equal his calculation of EV and is a variable of utmost importance given it represents the buyer’s capital-at-risk—i.e., the capital in the risk zone (see Figure 4 below) that will be written off should the target underperform so significantly that its EV comes in lower than the upfront payment. Often, buyers want to further derisk the transaction by lowering the up-front payment below their calculation of enterprise value, shrinking the risk zone. 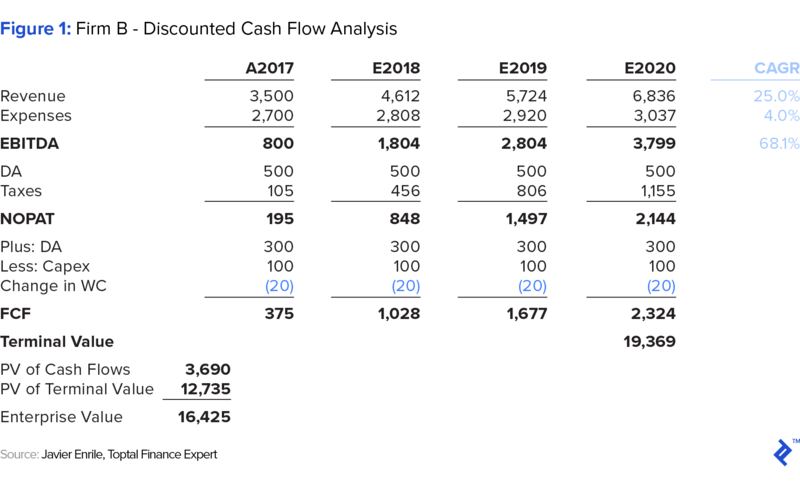 This case study assumes an upfront payment of $4 million, as Firm A has a high degree of confidence in its projections and analysis of Firm B’s cash flows. Contingent payment: The third step is to determine the contingent payment, where the contingent payment is defined as the total purchase price less the up-front payment. The implied contingent payment for purposes of this simulation is $12 million ($12,000,000 = $16,000,000 – $4,000,000). Earnout period: The fourth step is to determine the earnout period. Earnout periods typically have a duration of between one to five years, with an average of three years. In my experience, the earnout period should be long enough to provide the surviving management team sufficient time to achieve their goals but not so long as to induce “goal fatigue.” Our case study assumes an earnout period of three years, which is just shy of average. Performance metrics: The fifth step is to determine the performance metric which will be used, above all others, to evaluate the target firm’s performance. Such metrics should be mutually agreed upon, well understood, clearly defined, and easily measured. There are two categories of performance metrics, financial and operational. Financial metrics are typically revenue or profits based, e.g., revenues or EBITDA. Revenues is used when the target firm is fully integrated into the buyer, making it very difficult to measure the stand-alone profit profile post-assimilation. And profit-based metrics such as EBITDA are used when the target firm will continue to be operated as a stand-alone subsidiary with its own set of discrete financials. Operational metrics are typically measured via milestones and are most common in technology companies or pharmaceutical firms where a new product development can greatly increase the EV of the target firm. For purposes of our case study, EBITDA is selected as we are assuming the acquired company will continue to be operated independently into perpetuity. Measurement/payment frequency and methodology: The sixth step is to determine the measurement and payment frequency. There are two general options in this regard: (1) multiple, staged measurements and payments, executed annually or more often; and (2) a single measurement and bullet payment, typically at the end of the earnout period. As a long-tenured M&A practitioner, I will always advise against the multiple measurements/payments methodology because its process often comes with substantial tension, noise, and distraction for management. That said, and for obvious reasons, it is common for the seller to prefer smaller and more frequent milestones and payments, in order to stage and mitigate the adverse consequences to their operating risk. In addition to frequency of payments, the measurement methodology must also be determined. Two general methodologies exist: (1) a financial performance growth rate between the acquisition date and earnout maturation date, e.g., revenue or EBITDA compounded annual growth rates (CAGR), or (2) absolute value target, achievable between the acquisition date and earnout maturation date, e.g., cumulative EBITDA. Our case study assumes a single measurement and payment in December 2020 based on a 3-year EBITDA CAGR from 2017-2020. Target metric and contingent payment formula: The seventh and final step is to determine the target metric (i.e., the level of performance) and the corresponding payment amount for such level of performance. To balance risk and reward, the structure should provide rewards for partial performance by the target firm, even if it does not completely meet its performance goals—in other words, a binary, all-or-nothing approach is rarely seen in or by the market. Higher end of the contingent payment function: Shown as ① above, this is the target metric at which the full contingent payment is paid, typically set according to the performance forecasts submitted by the target firm’s management. This puts the buyer in a strong negotiating position as the seller must simply deliver on their forecast to receive their asking price. 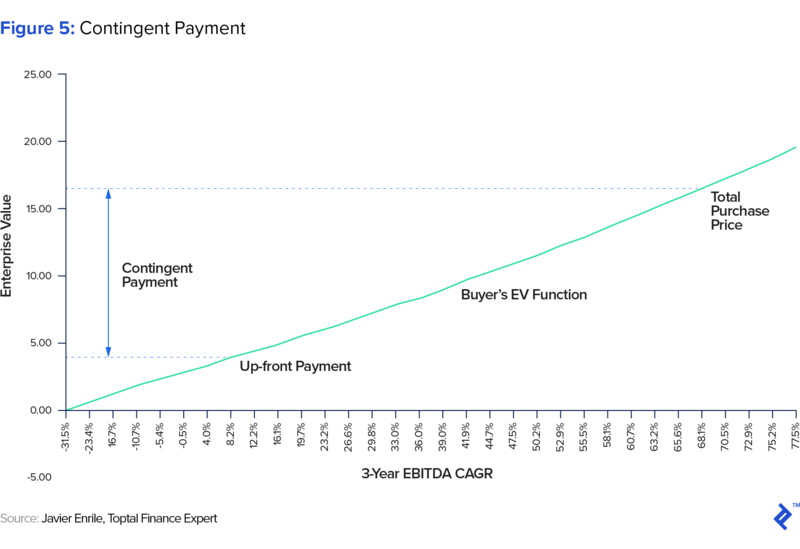 Note that, as a general rule, the higher end of the contingent payment should not exceed the buyer’s EV function. The case study assumes a target metric at the 3-year EBITDA CAGR of 68% to receive the full contingent payment of $12 million. Lower end of the contingent payment function: Shown as ③ above, this is the threshold outcome at which some level of contingent payment begins to be paid. There are two components that need to be determined ahead of this juncture: (A) the threshold outcome; and (B) the starting quantum of contingent payment assuming the realization of said outcome. It is important to note that the target metric (i.e., threshold outcome) should always be higher than (or to the right of) where the buyer’s EV function crosses the contingent payment function shown (shown as ② above). The logic is that having set the up-front payment, the buyer should only pay any contingent payment when the target firm’s enterprise value is at least equal or greater than the up-front payment, i.e., the break-even point. Most often, the starting payment is set at zero; however, depending on where the lower end is set, the seller may require some level of contingent payment. 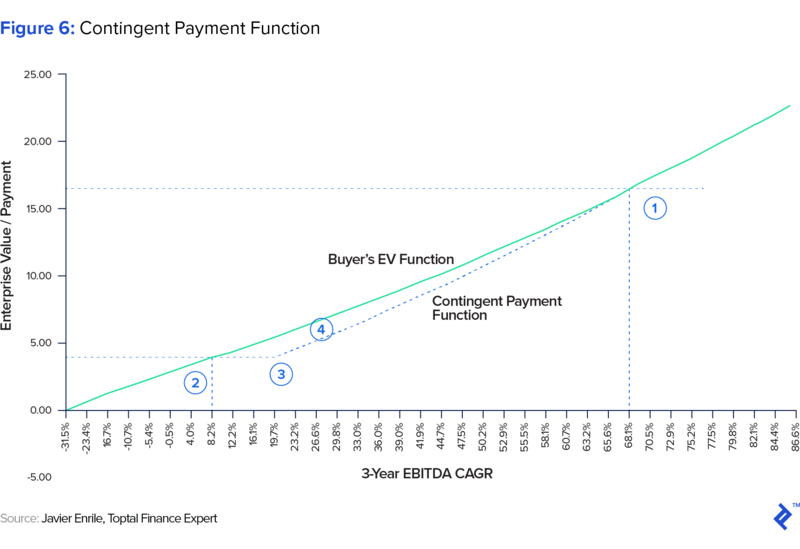 Note that, as a general rule, the starting contingent payment for a given target metric should not exceed the buyer’s EV function. The case study assumes the threshold outcome at a 3-year EBITDA CAGR of 19.7% and the starting quantum of $0. For purposes of the case study, we assume that the buyer wants to financially engineer a gain by setting a combination of the threshold outcome and the starting quantum which results in a gap between the contingent payment function and the buyer’s EV function (shown as ④). Contingent payment function—payments between the lower and higher end: This is typically calculated using linear or exponential interpolation—i.e., in an exponential function such that, as the rate of growth becomes higher, the contingent payments are also higher. The case study assumes a linear interpolation between the lower and higher end of the contingent payment function. 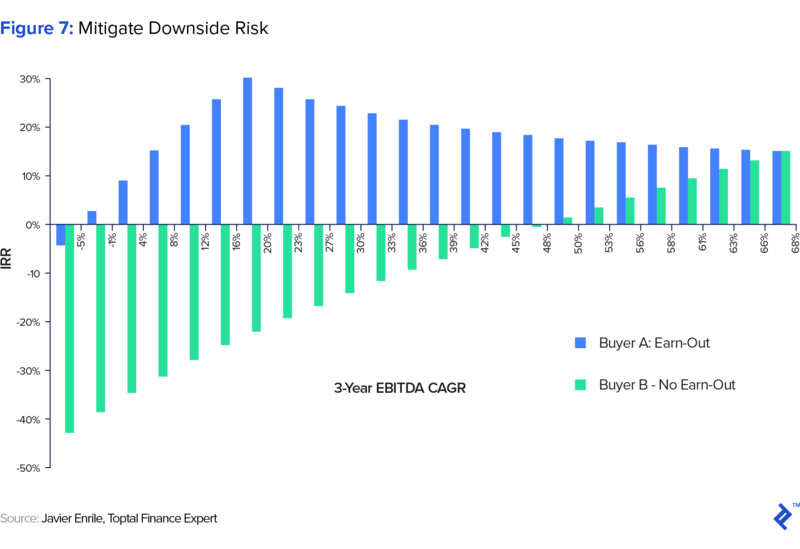 Often buyers and sellers agree on price; however, buyers perceive exogenous risks which could put downward pressure on the target firm’s performance and look to structure earnouts to shift the risk of underperformance to the seller. The most typical exogenous risks I have seen in my practice are recession fears and client concentration. We use the same case study to illustrate how earnouts mitigate the downside risk. Assume that there are two buyers for Firm B. Buyer A believes in Firm’s B three-year forecast at a 68% 3-year EBITDA CAGR and therefore he is comfortable paying $16 million all up front (no earnout). Buyer B also believes in Firm’s B forecast but expects with a high level of confidence that a severe recession is months away; therefore, puts in place the earnout (same structure as described above) to mitigate the downside risks of Firm B’s underperformance stemming from his macro views. Figure 7 below shows the IRR for both Buyer A and B as Firm B underperforms its growth expectation and provides empirical evidence that earnout structures mitigate downside risk. The IRRs with an earnout structure remain positive and much higher than that without an earnout in a scenario where Firm B underperforms by growing at a rate less than the 3-Year CAGR of 68%. In conclusion, the discipline of mergers and acquisitions is a complex and labyrinthine one, peppered with its share of false starts, thrilling chases, and heartbreaking shortfalls. The failures to consummate transactions, despite months of diligence and prep, courting on both sides, and an equal willingness to create value often spring from irreconcilable differences around valuation or from the inability of one or both sides to effectively mitigate risk. Earnouts, though oftentimes trying and difficult to negotiate, are one of M&A’s all-time greats as tools to both break purchase-price deadlocks and reallocate risk. I encourage aspiring and experienced M&A practitioners alike to study up and add this structure to their toolkit and skillset, if they haven’t done so already. An earnout is a contractual arrangement between a buyer and seller in which a portion or all of the purchase price is paid out contingent upon the target firm achieving pre-defined financial thresholds and/or operating milestones post-transaction. What is an earnout agreement? Earnout agreements are legal and binding contracts which legislate and detail the structure of an earnout. They detail the seven key elements to earnouts: (1) total purchase price (2) up-front portion (3) contingent payment (4) duration (5) metrics (6) measurement/payment method, and (7) payment formula. What is an earnout structure? An earnout structure is the sum-total of all the elements which aggregate to a negotiated earnout. These elements include the purchase price, including financial and/or operating thresholds/milestones, up-front payment, and contingent payment. What is an earnout model? An earnout model shows the relationship between the purchase price payments (both up-front and contingent) and the value of the firm. It is, in effect, the representation of the earnout’s payment formula, detailed in with great specificity in the earnout agreement. What is an earnout clause? An earnout clause is a specific provision or section within the earnout agreement or merger agreement that details in great detail the nature and purpose of an earnout structure.